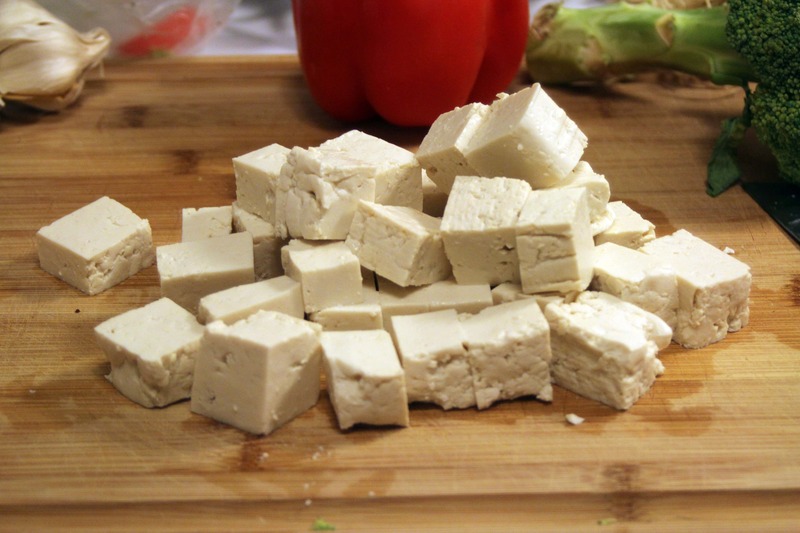 It’s a great day for tofu! Before you start a weekend of unhealthy binge – consumption (what? me? 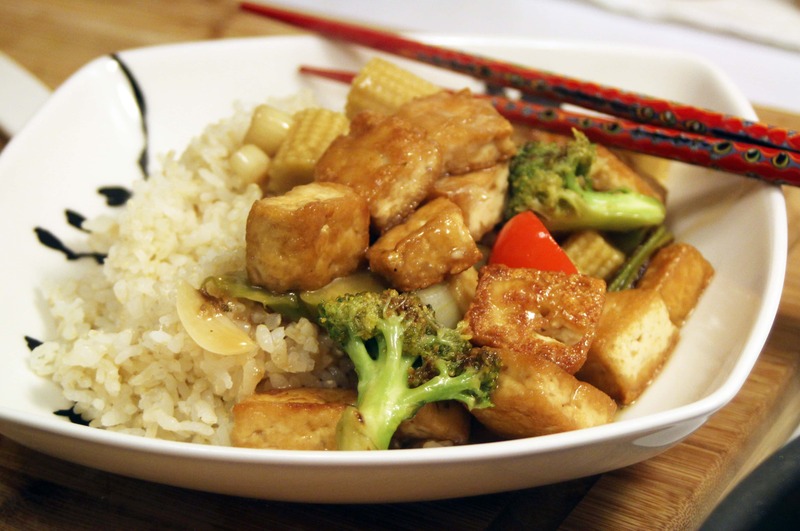 YES, you), why not have a lighter meal tonight with lots of veggies and a fabulously flavorful sauce? 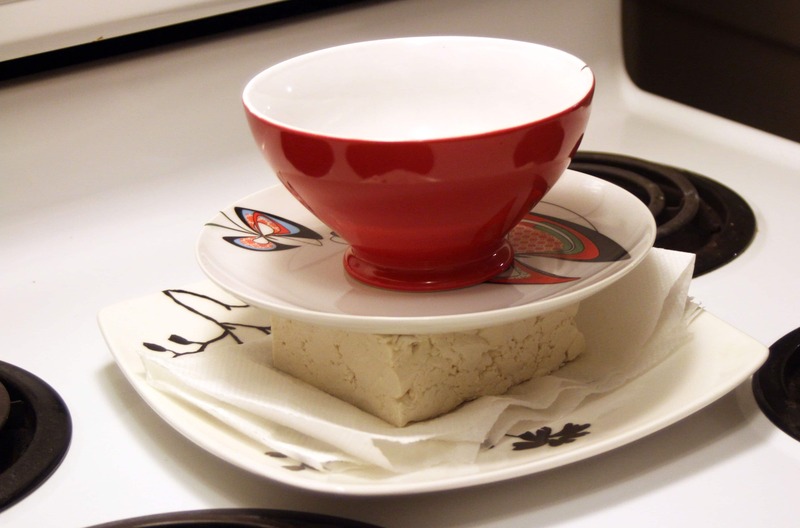 For the tofu, I like to press it between two plates with a can or something weighty on top to get some of the liquid out – do this for as long as you have time for! 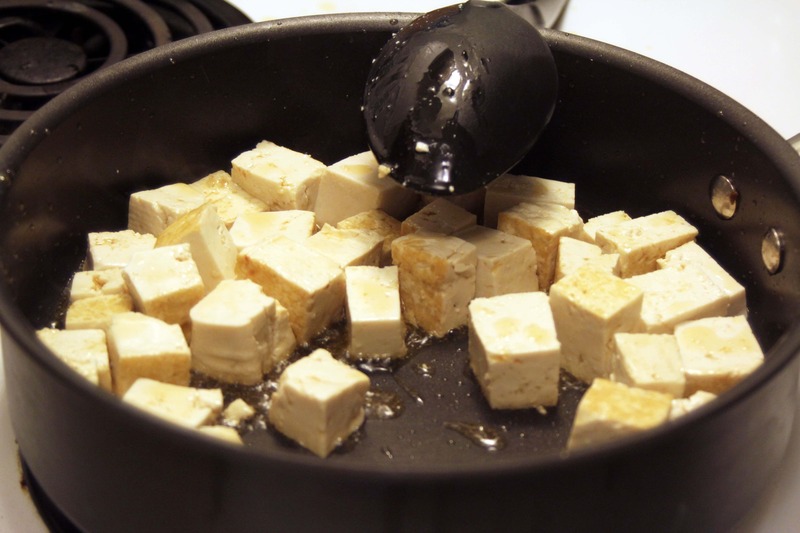 Then, preheat a pan to medium-high heat and cut the tofu into cubes. 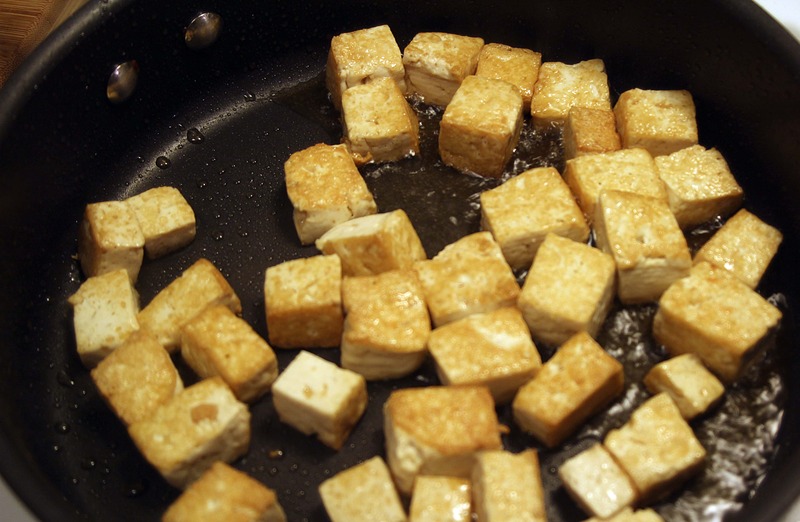 Add the tofu and the sesame oil to the pan and let the tofu cook and crisp for 10 minutes or so until it’s nice and crunchy on the outside. 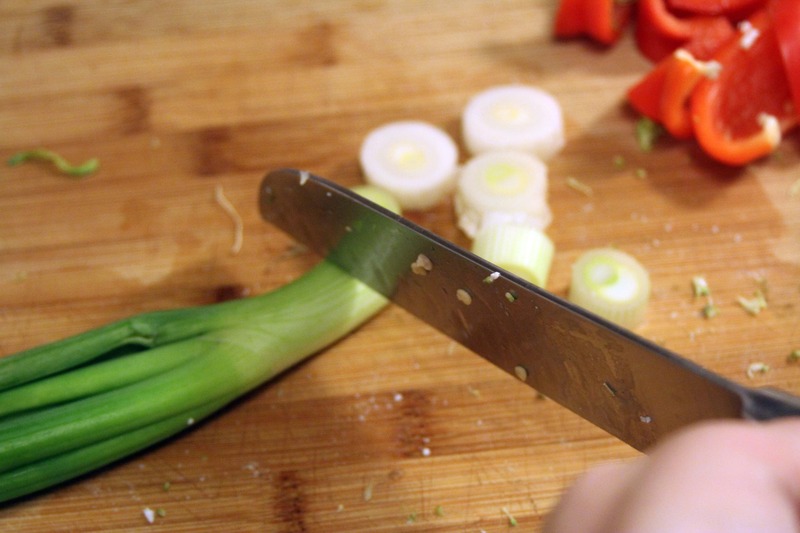 While that’s happening, cut your veggies into large chunks…. 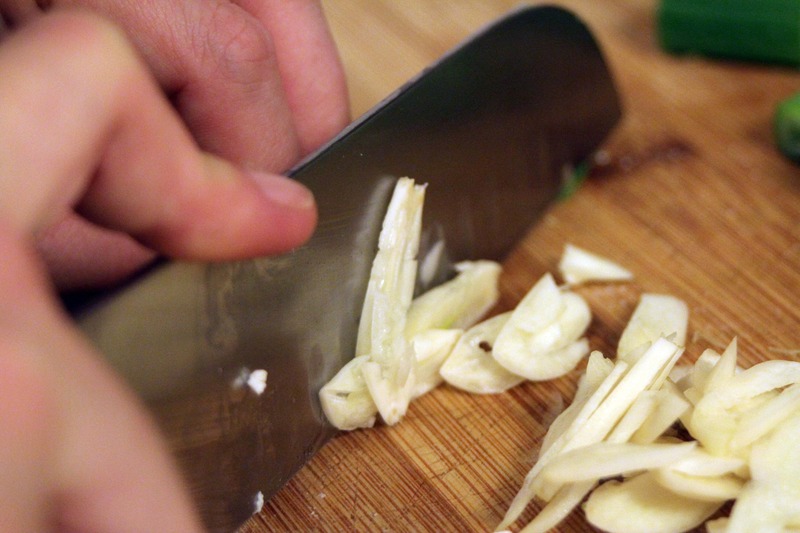 And thinly slice the garlic. Then, grab all your sauce ingredients! Yum. 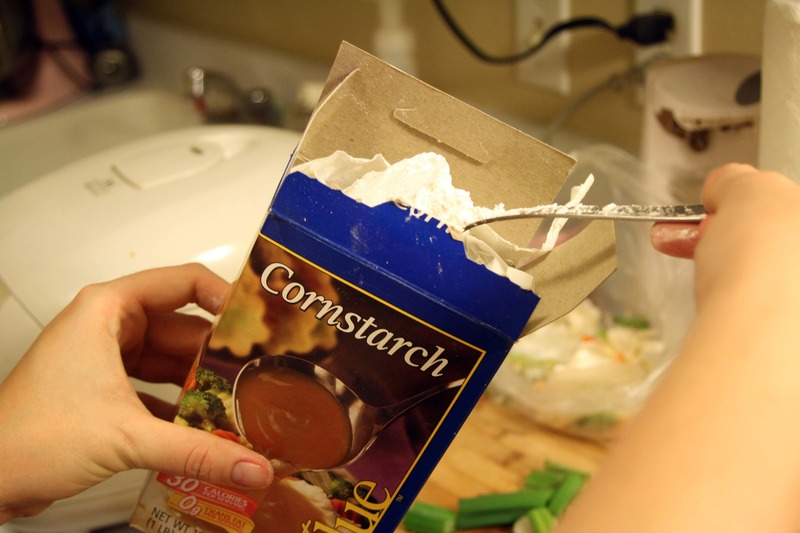 To a small bowl, mix the cornstarch with half of the stock. 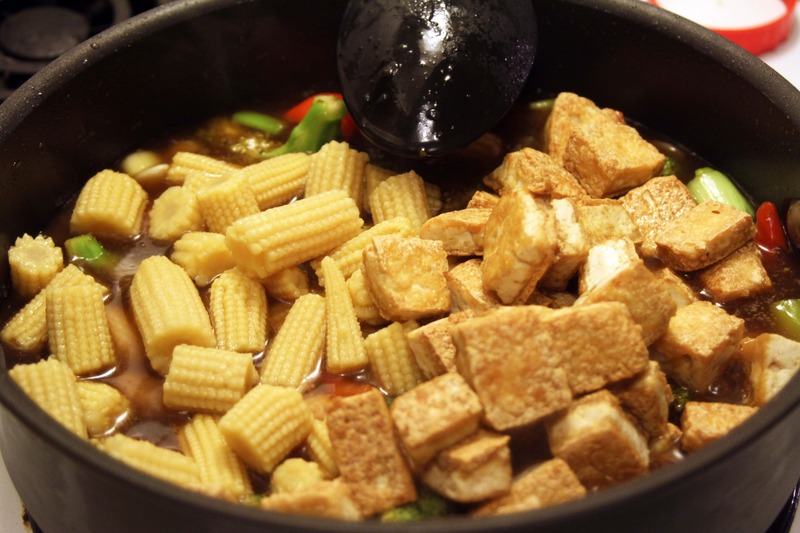 Stir it together well – we’ll use it to thicken the sauce in a minute! 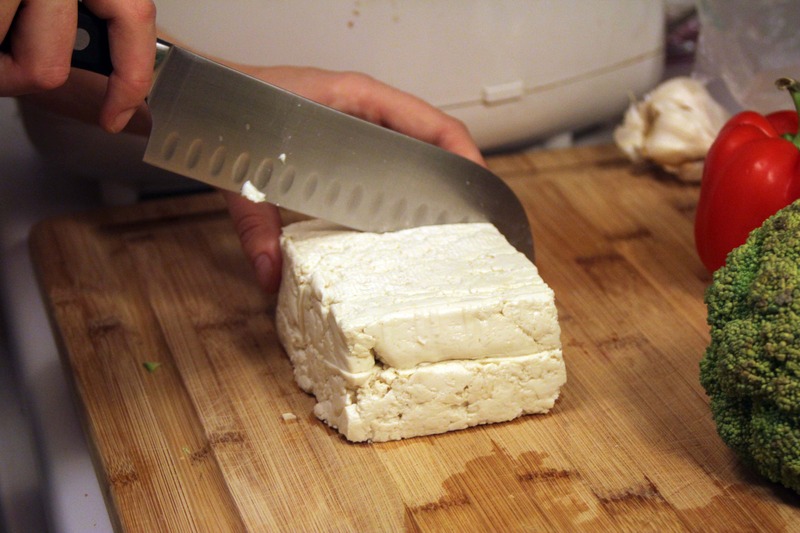 When the tofu is done, remove it to a plate to hang out, and add the veggies. 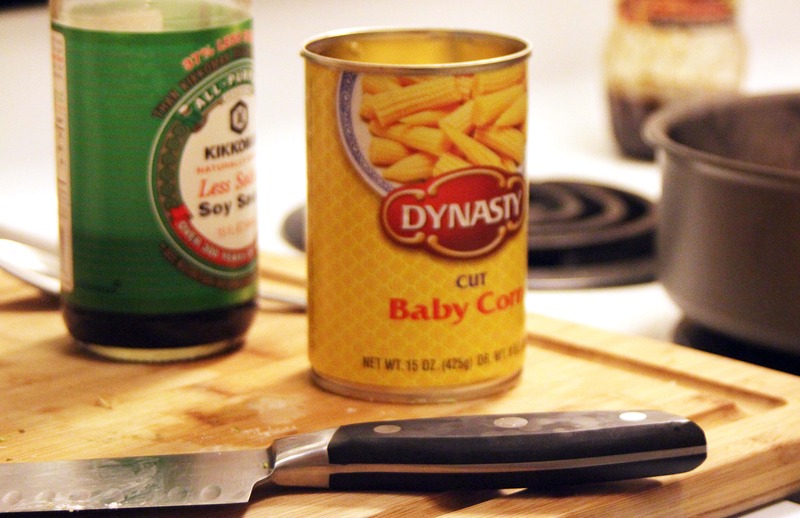 Let them cook for 1-2 minutes to start to soften. 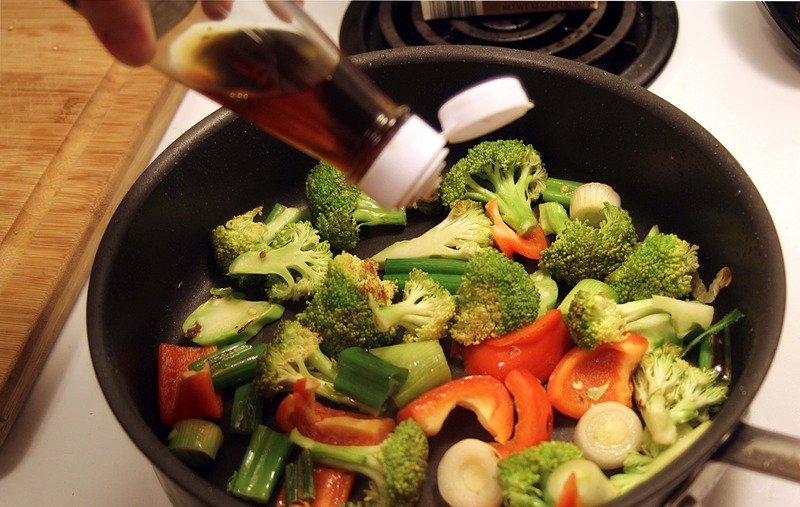 To the veggies, add the fish sauce, mirin, and soy sauce. 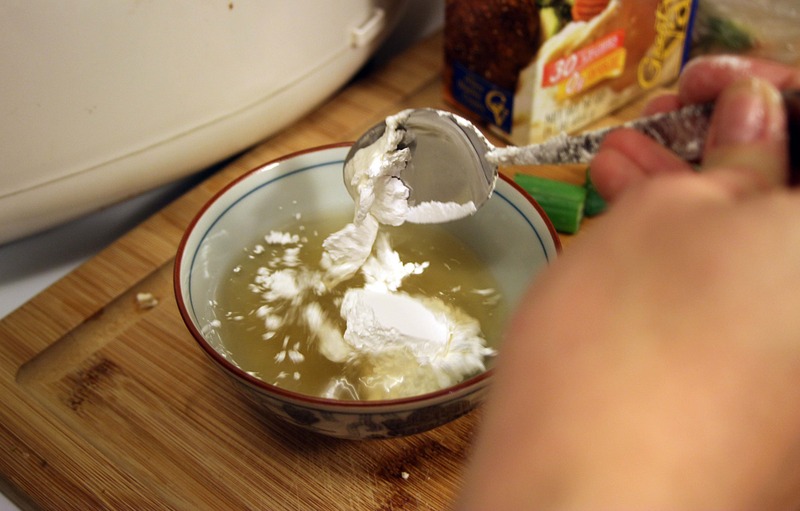 Stir that together, then lower the heat to medium and add the cornstarch mixture. 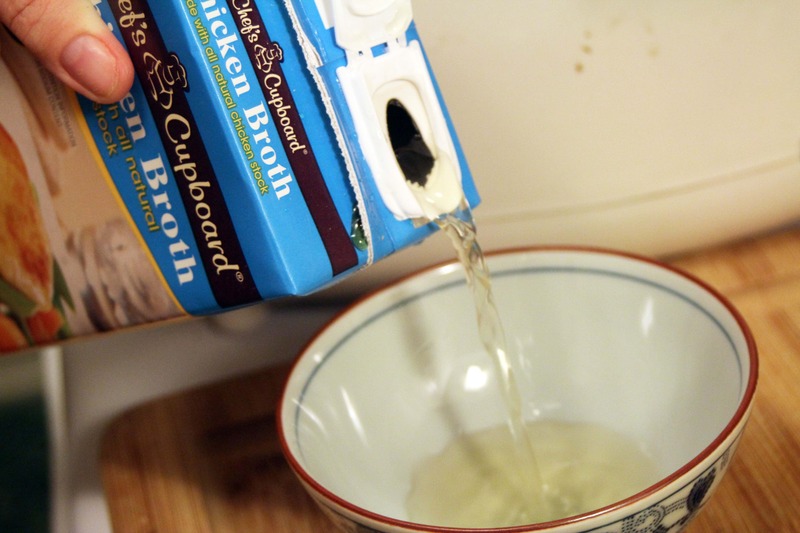 Stirring constantly, add more chicken stock until the sauce is the consistency you’d like it to be. 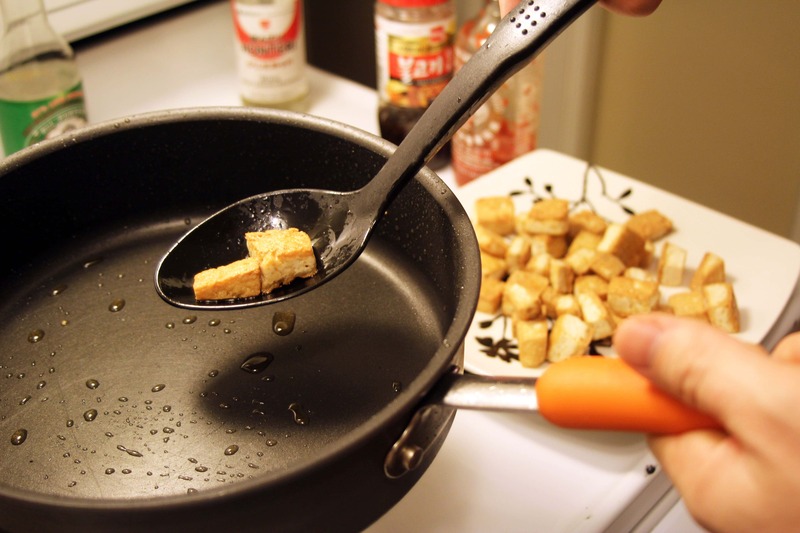 Then, taste, and add more soy sauce if you’d like! 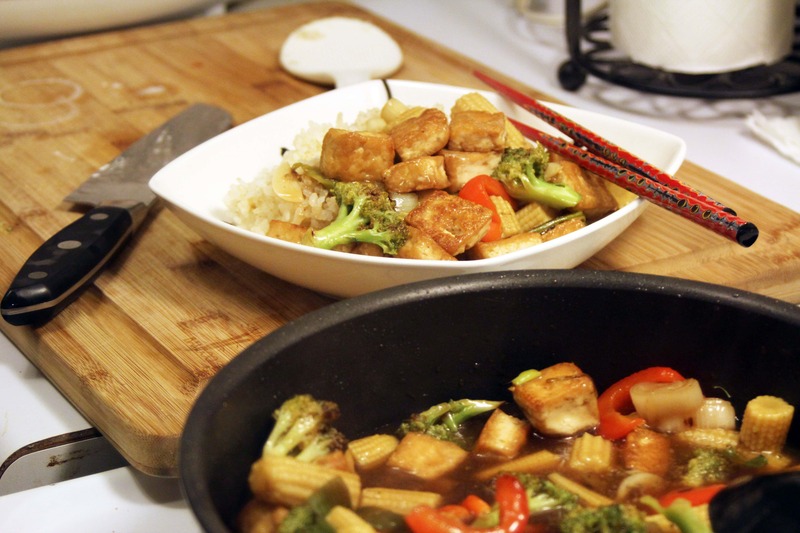 Right before serving, drain the Random Asian Veg of your choice and add that to the pan along with the tofu. 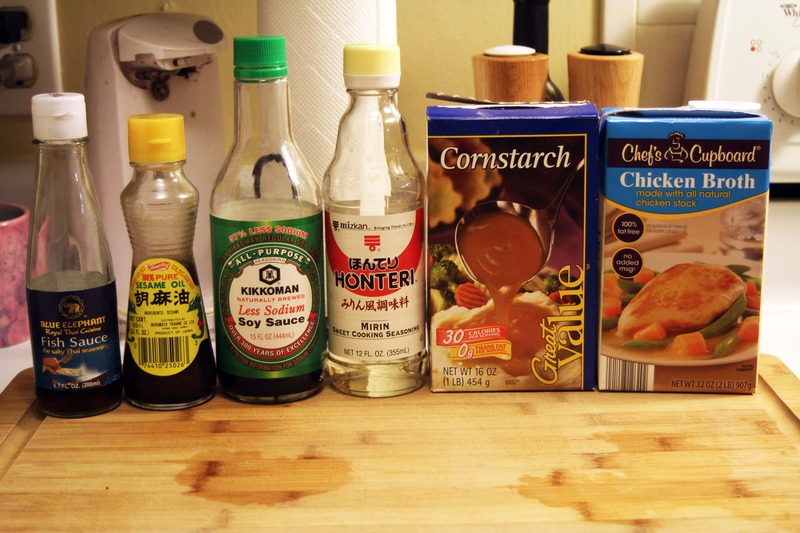 Stir everything together and let it warm for 90 seconds or so. Enjoy! This can be mixed up based on what veggies you have around, and you can switch up the protein any way you’d like! 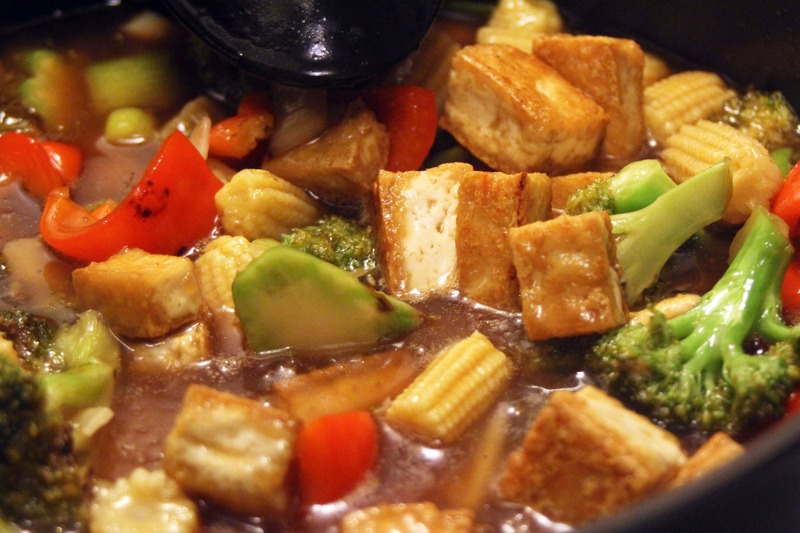 The best tip I can give for this is to not wait until the veggies are cooked to start the sauce. 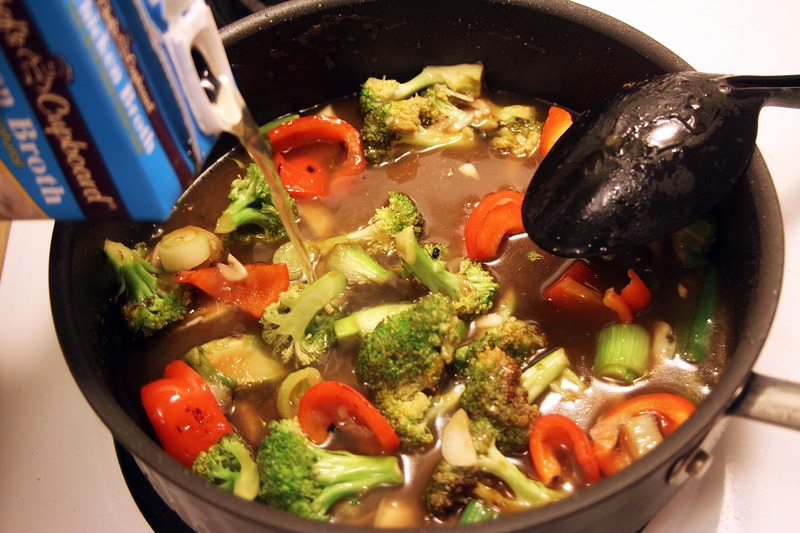 As you add the various ingredients the veggies will keep cooking, so if you create the sauce around totally cooked veggies they will be MUSH by the time you eat them. 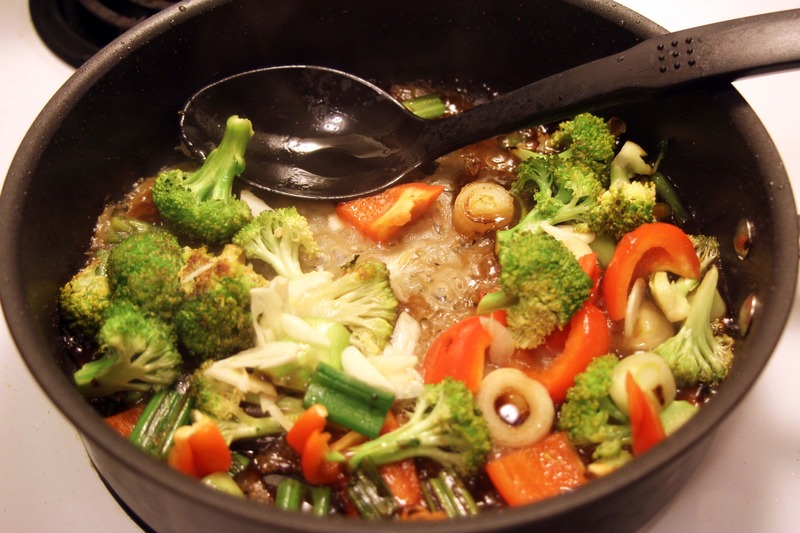 If you trust that raw veggies will cook in a bubbling liquid, you will make perfect stir fry every time. Yay!